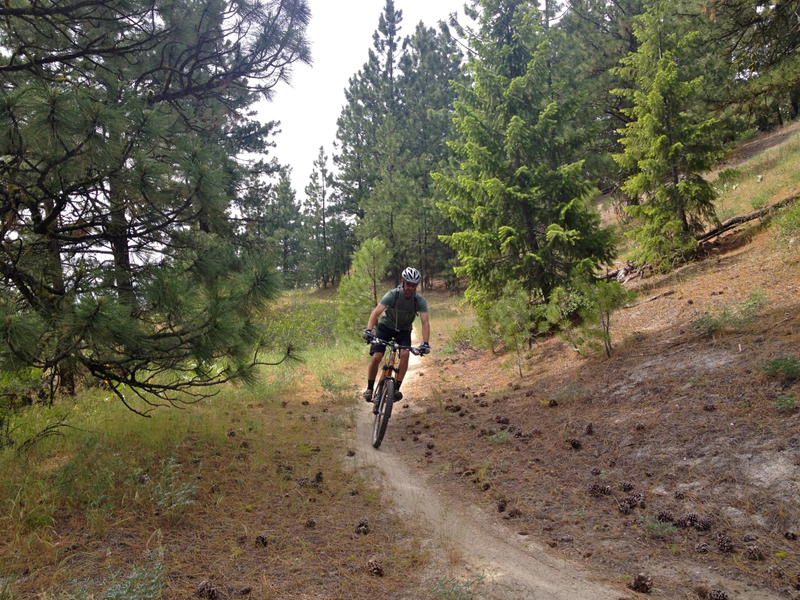 A flowing mountain trail on the flanks of cool, forested Shafer Butte is a sweet ride with fun, optional technical features. Late spring / after May 15 when snow is gone through late fall. Yes. Unless Fido is an uber-athlete, leave him at home. 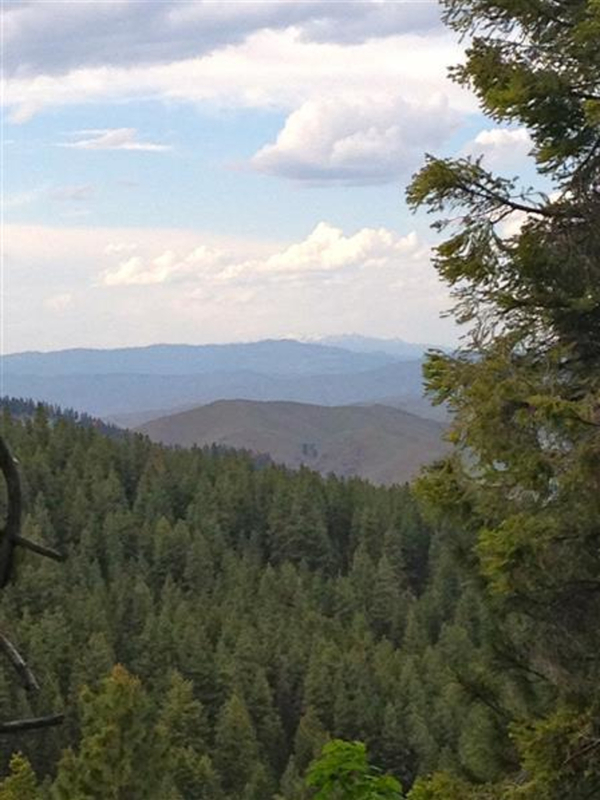 When waves of heat turn the valley into a hazy, sweaty daze, head up the hill toward Bogus Basin for this incredibly fun, flowing trail in cool forest. The reward comes first on the Eastside Trail. A short climb up Bogus Basin Rd. brings riders to the trailhead just before the road ends at the ski area. Look for a cut down into the trees on the west side of the road at a small pullout. Dropping quickly down and through a few switchbacks, after one short and steep climb the trail dips down again and rolls, banks, and hairpin turns through the trees. At times, the pines bend in close to the trail nearly brushing the shoulders of riders and at others, they open wide for views across the drainage towards Stack Rock. Along the way, the trail occasionally cuts down rocky terrain, banks hard through corners, and crosses creeks with short but sharp banks; in some spots it opens wide through small clearings and then becomes narrow singletrack along steep slopes in others. There are always options to get off to assess a good path before committing to ride. For those with tricky skills, log teeter-totters, bridges and berms offer technical fun. 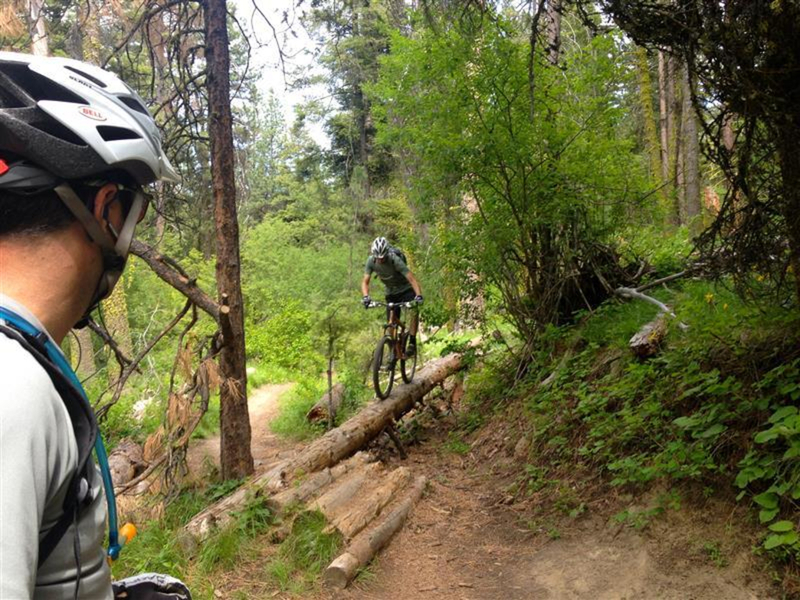 This trail is great for riders from experienced beginners to advanced. After intersecting Sinker Trail a second time above a creek, the climbing begins and all the fun up to this point gets paid back in sweat. The climbing steepens and levels, stair-stepping its way to the intersection with the main Stack Rock Trail. 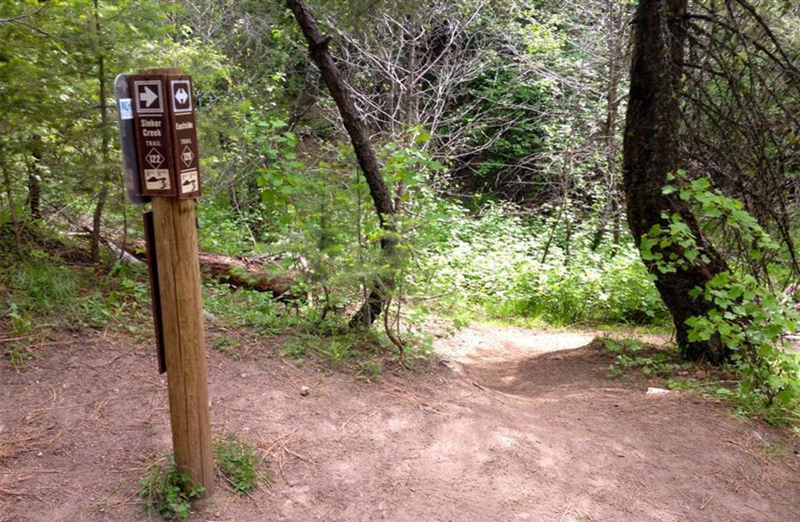 Taking a left, more climbing through the forest eventually dumps riders into a clearing at an unmarked trailhead sign. From here, crossing up and left to the established trail marks the start of a tough, relentless final climb. Ten to fifteen minutes of heart-pounding climbing will bring you back to the pullout where you parked (and hopefully a cold beverage in a cooler in the car!). Watch for a few very sharp, very steep and tricky switchbacks along this last stretch of trail, particularly right at the start out of the clearing. This trail is perfect for those comfortable on intermediate trails. The wide pullout to park at is located near mile marker 13 on Bogus Basin Road just a few miles before the ski area. Originally accessible as an out-and-back from the Bogus Basin Ski Area only, a relatively new stretch that leads from the pullout to Stack Rock and intersects with Eastside makes this a great loop. The Shafer Butte map from Ridge to Rivers does not yet include the link up to the parking pullout.